When you calculate the price to earnings ratio of a stock you divide the market price by the earnings per share. How do you do that for an index? You take the sum of the market cap of all stocks and divide it by the sum of the earnings. The NSE does that at a standalone level, every day, and gives us the daily P/E ratio of the Nifty. But how does this look for the Nifty when results are consolidated? Nifty’s standalone P/E is 22.71 today. 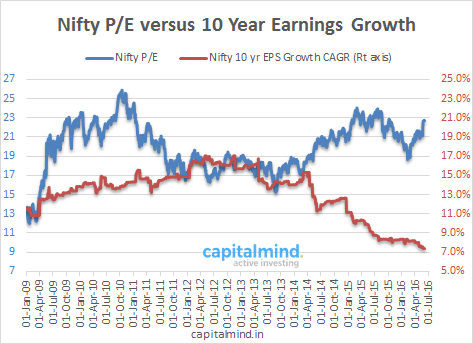 And today, using current market cap and consolidated earnings, the Nifty P/E is 20.4. This is still a very high P/E. Consolidated numbers tend to be about 10-15% higher than standalone numbers, so relative to the past, this is a reasonably high consolidated P/E number. What you can see here is a list of Nifty stocks, and each stock’s P/E and the last 12 month’s profits in Rs. Cr. Note: Some stocks have only revealed standalone numbers, so we used the standalone numbers where consolidated numbers aren’t available. How come earnings are growing at a miserable 0.71% over last year, and the P/E ratio is 20+? Of course, the standard excuse is that markets discount forward earnings, not hindsight. Oh, and that earnings have grown like crazy in the last 10 years. Well, not if you look at the data. The 10 year earnings growth for the Nifty (standalone) – as measured by it’s daily P/E ratio, released by the NSE every day is at it’s lowest since 2009. Note: You can’t get data beyond 2009 because the P/E data for the Nifty came first in 1999 – so the first 10 year number would be available only in 2009. Is this bubbly? Of course. Can it stay that way? Of course. Look closely at the above graph. The Nifty P/E has not fallen below 18 since April 2014. Earnings, though, have fallen hugely since then. This is one long unwavering bubble, and things like that can continue for a while. Markets were going up, earnings have been going down. The market doesn’t know anything about earnings – it basically thinks earnings are going up, and when they actually went down, they continue to believe that markets will, in the future, go up. The politicians and the companies have realized that reality is not important – it’s your perception of the future that is more important. And they’ve focussed on that. This bubble will not go bust until markets lose this perception. So as an astute investor, you have to remain invested, though the dose of reality ensures your feet are not to leave the ground. Because that way, you can run out the door faster when there is, for lack of an appropriate term, gravity.